Summer is in full swing and we&apos;re encouraging everyone to get outside and take advantage of all of the amazing outdoor recreation opportunities available in Raleigh, N.C.! One of the best ways to get active? 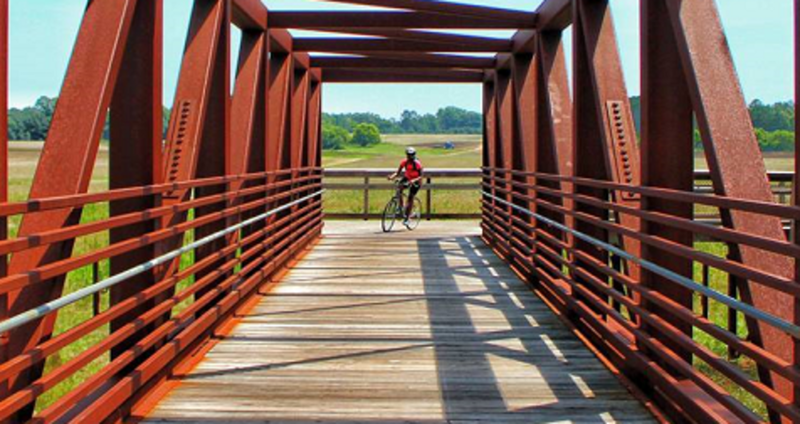 Explore the Neuse River Greenway Trail, spanning nearly 28 miles of paved trails across the eastern part of the city and offering views of historical sites, agricultural fields, jaw-dropping sunflower meadows and winding boardwalk areas and suspension bridges crossing over wetlands. Our #visitRaleigh photo of the week comes from Instagram user @vitulvrshny, who caught this perfectly-framed photo of a cyclist crossing a bridge in this scenic part of the greenway. Interested in more ways to get active on Raleigh&apos;s terrific outdoor trails? These 11 photos should provide some inspiration!